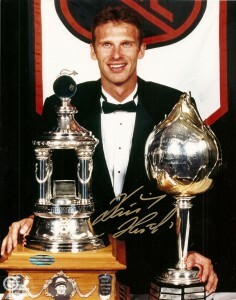 Dominik Hasek spent 16-years in the NHL. During that period he won the Vezina Trophy as the league's best goalie six times. He also won the Hart Memorial Trophy as league MVP in back-to-back years. To say that he is an accomplished goaltender is an understatement. 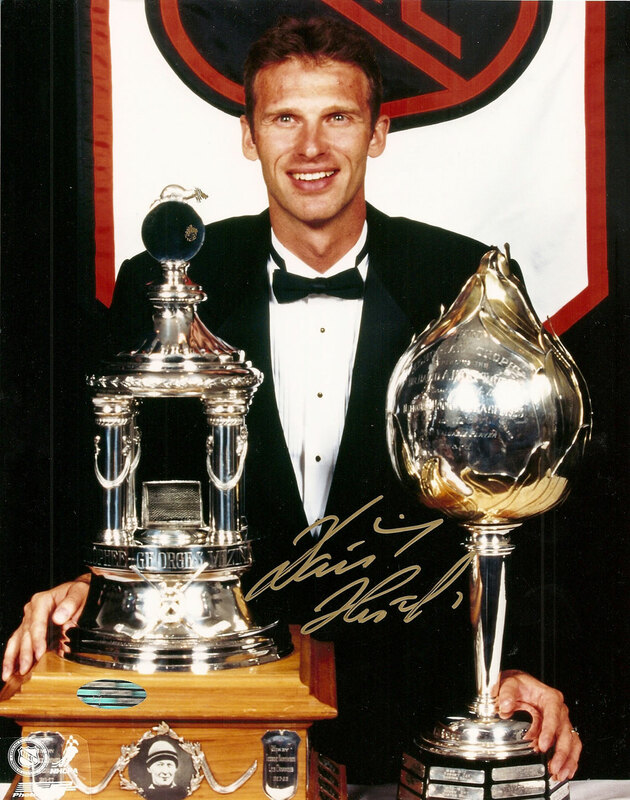 Because of this success, Dominik Hasek cards and memorabilia have a very loyal following with fans and collectors. 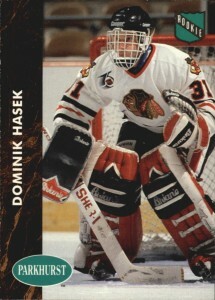 Hasek has nine rookie cards, all of which debuted in 1991-92 products. He also has a pre-rookie card from the 1990-91 season when he played in the International Hockey League (now the American Hockey League). All of his rookie cards are very affordable due to the fact that they were released during an era in the hobby when cards were produced in tremendous volume. His first certified autograph card is from 1995-96 Be A Player. A die-cut parallel also exists. Hasek's first memorabilia card was issued in 1997-98 Upper Deck Hockey. The card features a piece of a game-worn jersey. Not only is this Hasek's first memorabilia card, but it's also one of the first of its kind produced for hockey. That alone gives the card some historical significance and added respect among collectors. 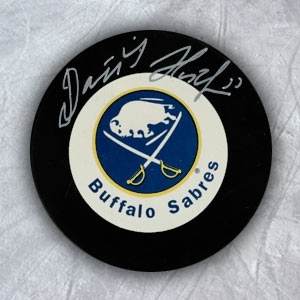 Dominik Hasek's autographed memorabilia carries a significant premium. He has been sparing with his commitments to dealers and show promoters thus limiting the amount of material in the market. Below you will find an example of what Dominik Hasek's authentic signature looks like. This can be used as a first point of reference for determining the legitimacy of autograph memorabilia, but is not a substitute for having your items authenticated by a well-respected professional autograph authentication company. Some of the trusted sources within the sports memorabilia market include the following companies: PSA, JSA, Tristar, and Mounted Memories. Click on any of the images below to view full size photos. The signature is written with care and fluid pen strokes. The "D" is written in a manner that it resembles and upside down and backwards letter "C" bisected by a vertical line on a 45-degree angle. The "o" resembles an "a." The "m' is more implied as is the "n," which is proceeded by a dotted "i." The "H" is very unique with loops on the bottom of the first parallel line and the top of the second. The "K" is distinguishable and exhibits an elongated loop on the upper portion of the vertical line.